I had a priest friend working in Ghana. He loved nature especially birdwatching, taking great delight in seeing the lovely different colored birds one finds in Africa. Once he decided to take a few days vacation and went into a large forest area near where he was working to observe the different kinds of birds. He took some food and drink. But after a number of hours of looking up into the trees he realized he was lost. However, he felt he could find his way out again. Two days later he was still lost and now having used up all the water he had he started to get dehydrated. So he then resigned himself to die. The next morning, and being very weak he was seen by a local Ghanaian hunter who chanced to pass by that way and in no time had guided him out of the forest to safety. He knows that this man saved his life by pointing the way out of the forest to him. Many people in our world today are searching for a way out of difficulty and seek people to help them this achieve this, whatever name you call this person, be it a psychologist, a spiritual director, a guide, a soul friend etc. In the gospel today we have the Wise Men who come from the East. They are searchers for the truth and discovered a star that they felt could guide them to what they were seeking. Eventually it did. Amazingly, they just found a small helpless infant in a manger with his parents and they had the humility to accept that this child was the answer to their search. What is the star that guides you in your way through life? Many people will seek to follow the star of power, money, fame, popularity etc. and for a time they may seem to have found that it works, but sooner of later they don’t have the deep peace and happiness that following Jesus gives us. But is it easy to say that for me Jesus is the guiding star in my life, that he is the light shining up the darkness of my life. How real is Jesus for you and me? Does he really make all the difference? (Personal witness). The star guided the Magi or Wise Men to Jesus but, on the way, they encountered Herod who sought to destroy Jesus if he found him. Who or what is Herod for me? Is there a person, a relationship, some worldly ambition, some tendency to sin in my life that may lead me away from finding Jesus and allowing him to be truly the guiding star of all I do. If there is something or someone why not talk to Jesus and ask him to help us overcome the difficulty. Having met Herod and the Jewish leaders the text seems to suggest that the star disappeared. But once they leave that situation (Herod) it appears again and guides them to Jesus. Sometimes, despite our best efforts, God seems to disappear from our lives. Even if we try to be faithful, Jesus seems far away. Remember Joseph and Mary lost Jesus for 3 days on their visit to Jerusalem. Such a similar situation in my own life might well be an invitation to be faithful to Jesus in good times and also in difficult times. It could be an opportunity to ask God’s help that I will remain faithful at this challenging time. The Wise Men offer their gifts to the child Jesus convinced that he is the one they were searching for. The Wise Men who came from afar were not Jews. They are outsiders in that sense. 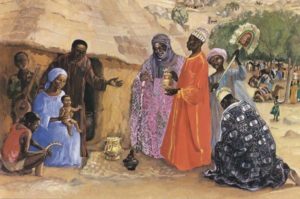 Today’s feast, the Epiphany means showing or manifestation, is the feast of God telling us that he wants to be known and loved by all peoples, regardless of colour, race or language. The Wise Men, having found the child, pay him homage. The account ends in a beautiful way. Having learned of Herod’s wicked intentions which were revealed to them in a dream, they “left for their own country by ‘a different way’”. We can assume that their having found Jesus had transformed their lives, because in the Bible a change of path symbolizes conversion. Must not this be the outcome of our encountering the Lord: a transformation of our lives, the capacity to take another way that is truly life-giving. The Good News is that God will reveal this to us if we ask in faith. It is free.